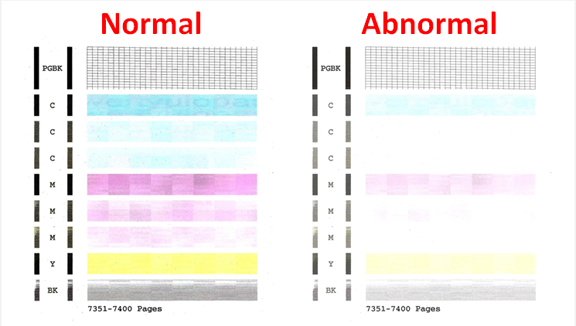 If, after activating the ‘Cleaning’ or ‘Deep Cleaning’ maintenance routine 2 times in a row, along with manufacturer’s suggested printer cleaning procedures, blank pages are observed or output print quality is extremely poor (for example, you observe several missing colors in the Nozzle Check Pattern Report where otherwise all colors should normally be present with no visible streaking), then the printhead may have partially dried out and a hot water flush of the PRINTHEAD may be necessary to help recover the ink system. NOTE 1: This procedure should be considered “a last ditch effort” just prior to printhead replacement and assumes that there is an adequate amount of ink available for the ink system recovery. For example, at least 30% of ink is available within each ink cartridge. This procedure should only be attempted after all other recovery suggestions, from Canon, have been exhausted. NOTE 2: The PRINTHEAD cleaning procedure is applicable to all Canon MP, MG, MX & iP printer models which feature a removable PRINTHEAD assembly. 1. To begin, remove all ink cartridges from the printer. 2. Remove the printhead. Raise the carriage assembly lever to unlock the printhead. Lift printhead straight up to remove. 3. Over a sink, run warm tap water directly into the 5 or 6 ink ports for approximately 2 minutes — this will effectively saturate the foam ports and blow ink out & thru the printhead nozzle plate bottom. 4. Using a lint-free towel, remove water from rear/bottom electrical contacts. Ensure printhead electrical contacts and exposed surfaces are fully dry. 5. Install the printhead into the printer. Lower carriage lever to lock printhead into place. NOTE: On select Canon printer models, after the print head is seated in the printhead holder, push the Head Set Lever towards the back of the machine to lock the printhead in place. 6. Install ink cartridges and close top cover. 7. 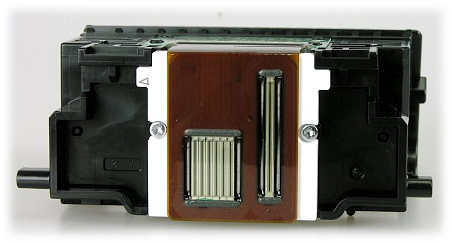 Re-seating or insertion of the printhead into the printer will consume approximately 8-10% of the ink and effectively re-prime all colors in the ink system. 8. At printer’s maintenance menu, activate the ‘Nozzle Check Pattern’. Verify all colors are printing properly. No visible streaking or fade should be present in the printed pattern. If you have reached this point of the troubleshooting and poor printing performance is still observed or a “replace printhead” printer error message is displayed, then the printhead may be electrically damaged or at end of life* and may need to be replaced. NOTE 3: Typically the average printhead should not reach it’s end-of-life* until after a minimum of 8 or more complete sets of cartridges have been used in the printer. Printing frequently, perhaps once or twice a week, is one of the best ways to maintain your printer’s overall PRINTHEAD health. It is suggested you refill your cartridge as soon as you see the print quality begin to fade — don’t wait until the last color runs dry! Continuing to print with a cartridge that is running dry can result in air bubbles being ingested into the printhead and will ultimately lead to poor image quality. The replaceable (or non-customer replaceable) PRINTHEAD will eventually fail over time with usage and age. * Check Canon User Manual to determine if your printer’s Printhead can be easily removed and replaced. *The electronic semi-permanent (or permanent) PRINTHEAD, which is responsible for pulling ink from the ink cartridges and firing ink drops onto the page, may eventually fail in time. This is primarily based on a combination of total printed pages (rated duty cycle) vs. image content and printing frequency. Dry firing, where one particular color is not printing, can significantly increase the chances of a permanent PRINTHEAD failure.